A new commercial for the Galaxy Note which aired during today’s Super Bowl continues Samsung’s current trend of mocking Apple and their fans at every opportunity. With more singing, dancing and theatrical tomfoolery than an episode of Glee, Samsung’s Galaxy Note Super Bowl ad (again) takes aim at Apple line-waiters, but fails to really sell any features of the new 5.3-inch smartphone. 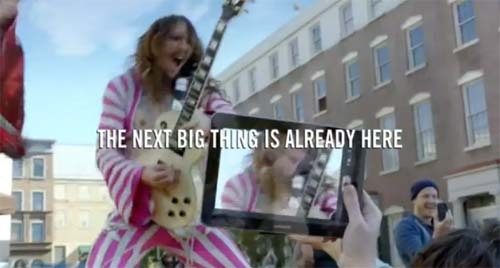 Directed by Bobby Farrelly (There’s Something About Mary), and featuring a host of cameos going Galaxy Note crazy in the streets to “I Believe In a Thing Called Love” by The Darkness – one thing is for certain, Samsung dropped a lot of cash.